Tackling College Student Slumps, Grades, and More! I’m so happy that you’ve stopped by. I want you to know that I’m listening to you loud and clear about what content you would like to see in the future. I can’t wait to get started on it! Have input you would like to give? I would LOVE for you to fill out this short five question survey! Encountering a Mid-Semester Slump? I’m Here to Help! One of the things I hated most about the middle of each college semester was the inevitable slump that always hit me. I would have all this motivation to do my work and get good grades, but I felt myself sinking into a slump about midway through my term. Obviously that wasn’t the most ideal time since I had midterms and tons of papers due! It took some time, but I eventually figured out what I could do to conquer the mid-semester slump and get myself back on track. I wrote an entire article that addresses this issue over at The Young Hopeful, and I realized that I haven’t shared the link with some of you! If you follow those tips, you should have no problem conquering your mid-semester slump in no time at all! Even if you aren’t feeling the effects of a slump, odds are that you’re going to encounter some grade troubles at some point as a college student. It took me three years to finally get myself at a point where I had a good grip on what I needed to do to get good grades (and maintain them all semester). I would hate to see you go through the same thing, which is why I wrote My Secrets to Getting A’s in College (and How You Can Too)! I want you to be a successful college student and achieve awesome grades, so I hope you’ll take a few minutes to go check out that post. Even if you’ve visited it before, I encourage you to look over it again and really put each tip into practice! It Seems Like No Matter What I Do, There’s Just NEVER Enough Time to Get My Work Done! I felt so overwhelmed during half of my college years and I literally didn’t think it was possible to get it all done and still enjoy some free time. Time management seems to be one of the biggest struggles for college students and that’s why I’m working on some BRAND NEW content that focuses on this issue (way more in-depth than I did in some previous posts). Until that content is ready, I hope you’ll read Solutions for Every College Student’s Time Management Problems and How to Stay Motivated in College. 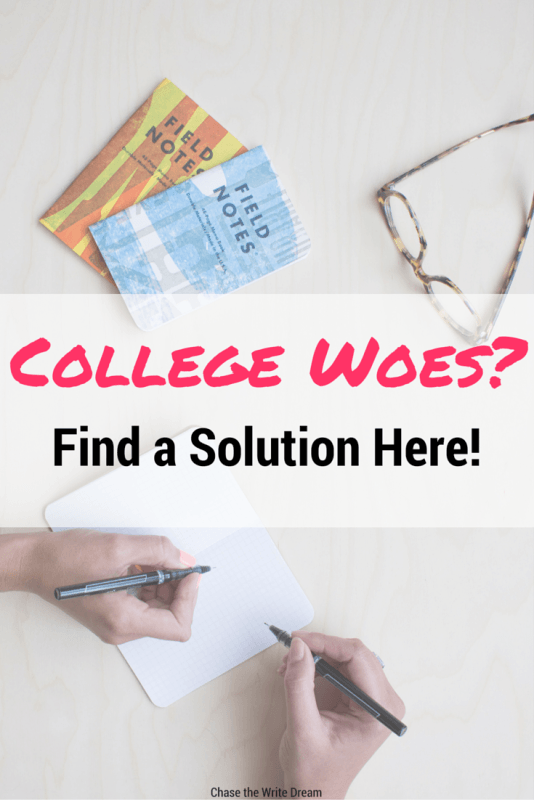 Feel free to sound off in the comments below if you’ve got a college problem that you want extra help with! Yay for being in your 4th year! Definitely let me know when your post comes out 🙂 I’d love to read it and share it!